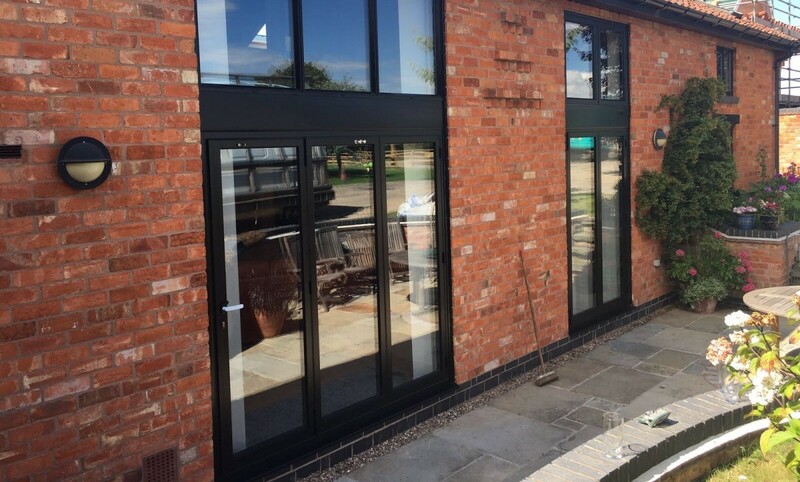 The Origin bifolding door is arguably the best known bifolding door in the UK today and a highly desirable bifolding door amongst homeowners. If you’re looking for one of the finest and best made bifolding doors, with the longest guarantee and a host of other features, Origin cannot be beaten. Basfords are an approved supplier and installer of Origin folding doors. We’ve even won an award for this product – testament to our quality, professional installations and many delighted customers. So what makes the Origin door so special and why do we recommend it? Why the Origin bifolding door is special and right for you. The Origin bifolding door is the best selling door in the UK. It comes from the world’s leading specialist manufacturer of bifolding doors in aluminium. Our Origin doors offer total flexibility. Choose from two pane right up to eight pane doors. You can have doors that open in or out, slide to the left or right and even both sides. All come in a choice of opening options. Discover the market leading Origin Bifolding Door. All our Origin bifolding doors are bespoke to your precise dimensions, colour and hardware choices and design. There are many advantages to the Origin Bifolding Door and how it can enhance your home. In addition they come with key features that make these doors unique compared to other folding doors on the market. Because Origin Doors are only made in-house and by one company it is your guarantee of consistent quality every time. Other folding doors on the market are manufactured by a vast number of fabricators that obtain the aluminium profiles and hardware to produce their folding doors. Often the end user won’t know exactly where their doors came from and quality cannot be consistent. With an Origin door you have the peace of mind that your doors are only made by one company – the company that designed them. An Industry Leading 20 Year Guarantee. Origin bifolding doors are the only folding doors on the market that offer a 20 year guarantee. Your new folding doors will come with a unique serial number that enables an accurate record to be held about your doors. In addition this unique serial number enables your door to be easily identified should you have any questions in the future. Exceptional security and weather performance. An Origin door consists of a sophisticated 8 point multi point locking system. This secure locking means your door is tested to the Stringent Secured By Design standards. In addition you benefit from deep throw hook locks, anti lift bars, high security hinges, anti-bump cylinder. Furthermore, your doors are glazed from the inside to prevent the removal of glass from the outside. All hardware fitted to our doors is unique to the product. It is extensively cycle tested to give you trouble free, smooth and light doors for many years to come. You can choose from a bespoke range of door handles in a choice of styles and finishes that are beautiful to use and built to last. Our bifolding doors offer the very best in weather performance to protect your home from the elements. You will benefit from advanced weather seals and exceptional engineering. Our doors are tested to the most stringent weather performance standards. All of these features and more mean security for your home and peace of mind for you. Origin doors are coloured by the very latest in sophisticated polyester powder coating technology. Not only does powder coating offer you virtually unlimited colour choice but it is durable, weather resistant and will look good for years to come. A simple clean is all that is required to keep your new doors looking like new. But you can also enjoy even more design freedom. Choose from over 150 colours including satin, matt and gloss shades. Discover the latest in wood effect power coating to give you the look and feel of real wood. Even if your doors are being fitted in a coastal, swimming pool or other harsh environment we offer special paint finishes and extended guarantees. Visit our showroom and discover how the elegant and sophisticated Origin folding door offers you so much more. Discover how your new bifolding doors can seamlessly connect your inside and outside spaces. Our doors are crafted from slim yet strong aluminium. You benefit from maximum glass area, thermally efficient profiles and impressive aesthetics. Our doors feature standard or colour coded gaskets that protect young fingers from being trapped in the door. As standard your doors come with discreet yet strong magnets to hold the doors in place when open. We will supply your new bifolding doors with the finest in double or triple glazing. Our glass is of the finest quality. Toughed safety glass comes as standard. Low emissivity coating, argon gas fill and warm edge spacers all work together for the ultimate in comfort, energy efficiency and security. A complete solution for your home. Origin doors can also be made as French Doors and single doors. So if you also require other doors in your home you can enjoy the same features. You can even improve your home with the state-of-the-art Origin Window. Whatever you choose you are assured of an exceptional product, a professional installation and a caring after sales service. Basfords are your Origin door experts. Basfords are your local Origin Trusted Partner and an award winning bifolding door company. Visit our comprehensive showroom where you will find, expert knowledge, a personal service and a choice of bifolding doors on display. Call us today on 0115 895 4948. With our expert help and advice we can help you transform and add value to your home with our market leading range of bifolding doors. The Origin door gives you premium quality, a bespoke door and a host of feature to enhance your home all year round. A 20 year guarantee not available on any other bifold. Finger safe gaskets also available colour matched to your doors. High quality running gear, components and fittings. The Origin door is also the only door in the UK available on super fast lead times if required. These are exceptional manufacturing lead times intended to meet any build programme. We can work with you to ensure your doors are delivered and installed promptly and on time. All our Origin doors are fitted with the finest quality toughened safety glass. Laminated glass for even greater security is available as an optional extra. Origin bifolding doors benefit from the very latest in polyester powder coating technology. The result is a premium quality finish that is built to last and will look good for years. All that is required is routine cleaning with a mild soapy solution. Our powder coatings accompany the 20 year guarantee only available on Origin doors. For doors in coastal, exposed or swimming pool environments, special heavy duty coatings are available. Origin Doors come in a choice of over 200 RAL colours giving you virtually unlimited colour choice. Our standard range of colours comes in satin, matt or gloss finishes. If you’re seeking a highly contemporary finish why not look at our metallic shades too. We also offer our highly unique wood effect finishes. These are specially created for those seeking all the benefits of an aluminium bifold but with the appearance and feel of real wood.